Several experimental philosophers have found that philosophical intuitions of both professionals and laypeople are sensitive to the order in which the thought experiments they come from are presented. A nice summary of the latest results about this by Schwitzgebel & Cushman can be found here. But now, not one but two new papers critical of this body of research are set to appear in Synthese (what did order effects ever do to you, Synthese?). One paper “Ordering effects, updating effects, and the specter of global skepticism” by Zach Horne & Jonathan Livengood questions the assumption that order effects indicate philosophical intuitions are unreliable. Another paper, “How not to test for philosophical expertise” by Regina Rini claims to have identified a deep methodological problem invalidating most findings about order in philosophy! Clearly a particular way of doing philosophy and moral psychology is being mocked. Philosophers and psychologists often rely on unrealistic thought experiments and experimental stimuli when conducting their research. To be fair, they do tend to avoid the surreal, but this does raise an interesting question. How worried should we be that deep down, we don’t actually believe the things we are asked to imagine as we make philosophically and psychologically relevant judgments about them? Within the more metaphilosophically-oriented literature on experimental philosophy, there has been a great deal of discussion of the philosophical implications of cross-cultural differences in intuitions about Gettier cases. This work has been extremely impressive from a purely philosophical perspective, but at times, I worry that it has not been sufficiently closely connected to the actual empirical work in this area. In particular, much of it starts off from the assumption that people of different cultures differ in their intuitions about Gettier cases, but it turns out that the majority of the empirical studies actually find that Gettier intuitions do not depend on culture in this way (see here, here and here). So it sometimes seems that people are investigating the philosophical implications of an effect that doesn't actually exist. Overall, the study finds a robust tendency, found across all four cultures, to conclude that people do not have knowledge in Gettier cases. Of course, this finding does not mean that philosophers were mistaken to think that there was something of deep metaphilosophical importance about looking at Gettier intuitions in different cultures. On the contrary, the result obtained here is a truly fascinating one, which surely has rich metaphilosophical implications. The key point is just that the metaphilosophical question we need to be asking is the opposite one from the one people have been discussing thus far. The question worth asking is not 'What are the metaphilosophical implications of cross-cultural differences in Gettier intuitions?' but rather 'What are the metaphilosophical implications of the extraordinary cross-cultural similarity in Gettier intuitions?' This latter question has not yet been sufficiently explored, but it opens up a whole new range of exciting issues that I hope philosophers will begin exploring over these next few years. In the first issue of the recently launched on-line open-access journal Feminist Philosophy Quarterly, there is a piece by Gaile Pohlhaus Jr. entitled, "Different Voices, Perfect Storms, and Asking Grandma What She Thinks: Situating Experimental Philosophy in Relation to Feminist Philosophy." It has made its way onto my never-ending reading list! At first glance it might appear that experimental philosophers and feminist philosophers would make good allies. Nonetheless, experimental philosophy has received criticism from feminist fronts, both for its methodology and for some of its guiding assumptions. Adding to this critical literature, I raise questions concerning the ways in which “differences” in intuitions are employed in experimental philosophy. Specifically, I distinguish between two ways in which differences in intuitions might play a role in philosophical practice, one which puts an end to philosophical conversation and the other which provides impetus for beginning one. Insofar as experimental philosophers are engaged in deploying “differences” in intuitions in the former rather than the latter sense, I argue that their approach is antithetical to feminist projects. Moreover, this is even (and perhaps especially) the case when experimental philosophers deploy “differences” in intuitions along lines of gender. While you're at it, check out some of the other interesting articles in the volume as well. The more journals like this, the better. Does X-Phi need to assume Centrality? In my new paper in Philosophical Studies, I explore recent arguments by Cappelen, Williamson, and Deutsch that intuitions are not used as evidence in philosophy. I argue that a rejection of 'Centrality' doesn't undermine the importance of experimental criticisms of philosophical method. Fiery Cushman and I have a new paper in draft, exploring the question of whether professional philosophers' judgments about moral dilemmas are less influenced than non-philosophers' by factors such as order of presentation and phrasing differences. We recruited hundreds of academic participants with graduate degrees in philosophy and a comparison group of academics with graduate degrees in other fields. We gave them two "trolley problems" and two "Asian disease"-type framing effect cases. We presented the trolley problems either with a Switch case first (the protagonist saves five people by Switching a runaway trolley onto a side track where it kills one), followed by a Push or Drop case (saving five by Pushing one person into the trolley's path or by Dropping him into its path), or Push/Drop first, followed by Switch. For each scenario, participants rated the protagonists' choice to kill the one person to save the five others, using a 7-point scale from "extremely morally good" to "extremely morally bad". 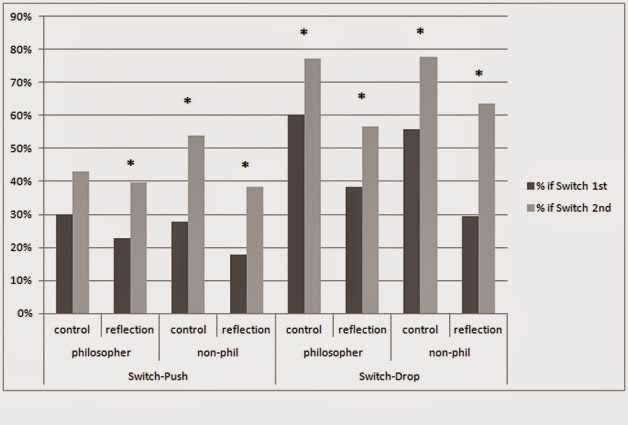 Our previous research suggests that non-philosophers are much more likely to judge the Push case and the Switch case equivalently when Push is presented first than when Switch is presented first. On some views of philosophical expertise, philosophers' judgments about these cases should be less dependent on order of presentation than are non-philosophers' judgments. In other words, philosophers, due to their familiarity with scenarios of this type and their expertise in applying moral principles to them, should have more stable opinions, less influenced by order of presentation. 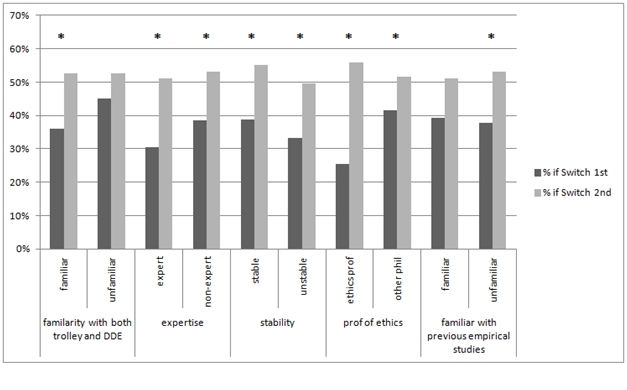 We wanted to see if philosophers with prior familiarity with the cases, or self-reported expertise in the area, or self-reported stability of opinion, would show smaller order effects. We also wanted to see if we could reduce order effects by encouraging participants to reflect carefully on different versions of the scenario and different ways of phrasing the scenarios and enforcing a delay before responding. The order effect, as indicated by the differences in height between the black and the gray bars, is basically the same for philosophers and the non-philosophers, even in the "reflection" condition.